Bangkok is a fun, crazy and exciting city to visit! 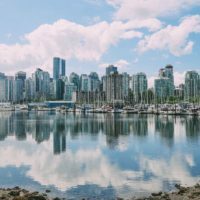 Chances are you kinda already know this, even if you’ve not visited yet – it’s reputation precedes it! 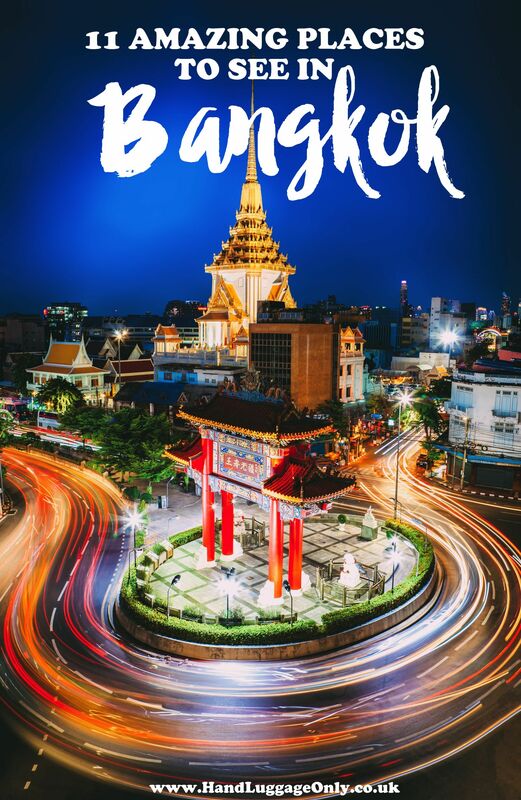 In the midst of all this activity (and potential partying – I did say it’s a fun city after all), Bangkok is also filled with lots of beautiful sights to see and so a trip here is one that we recommend, no matter what type of traveller you are – there’s something for you in this amazing city. 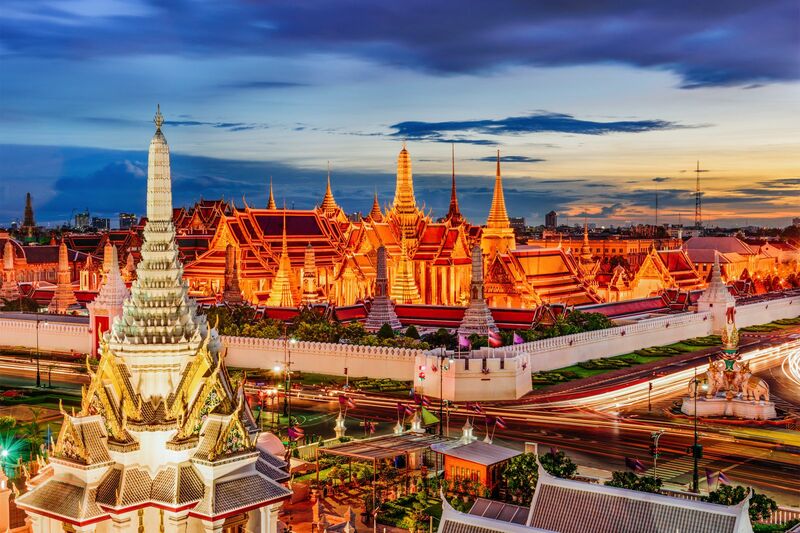 With that said, here are 11 amazing places you have to visit in the capital of Thailand. 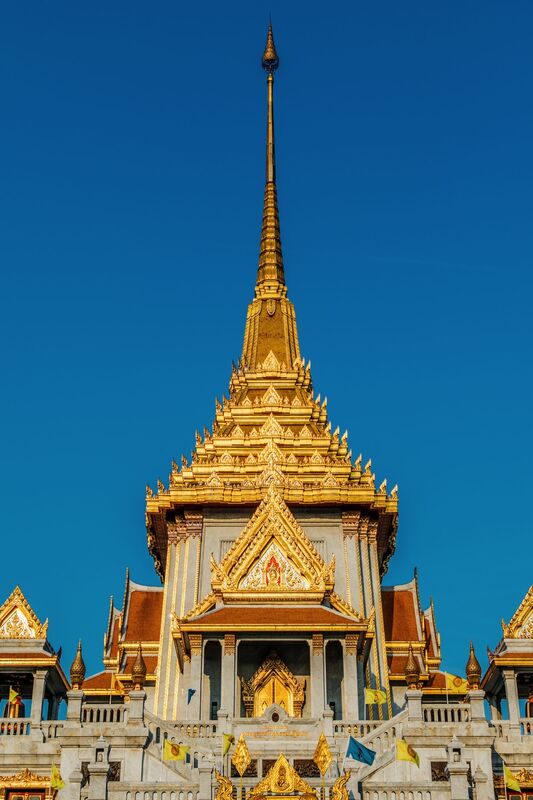 Built in 1782, the Grand Palace is an immense complex that has served as the royal residence for generations. 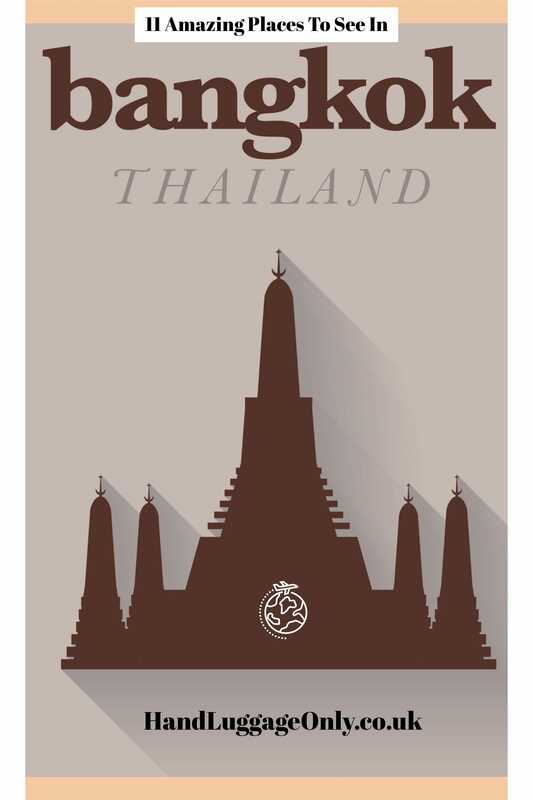 If you visit only one sight in Bangkok, it has to be this! Here you can find the museum of textiles, the Royal Pantheon and the stunning Wat Phra Kaeo Temple that houses the legendary Jade Buddha. 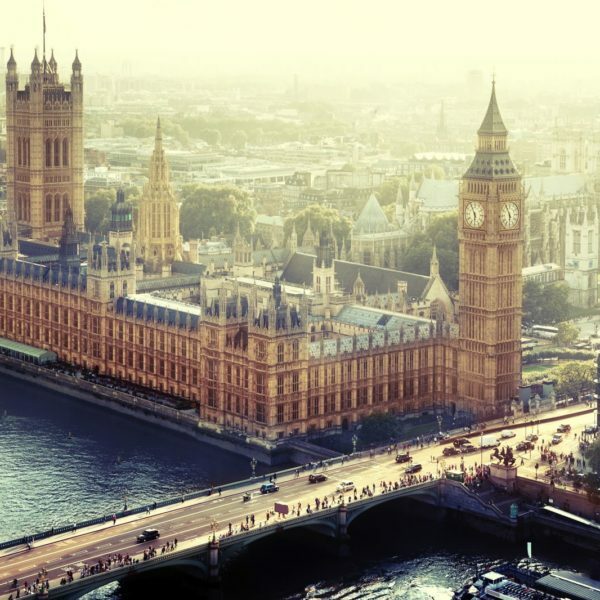 You will be enthralled by the architecture and amazed at the history of this important complex – to truly make the most of this site, it’s probably worth considering taking a guided tour (though this is by no means compulsory). As one of the many gorgeous temples in Bangkok, Wat Benchamabophit is a really important (and pretty amazing example of) a Buddhist temple. It really is gorgeous to see! Make sure to pop over, wander through the grounds and see the incredible buildings. You’ll love it. 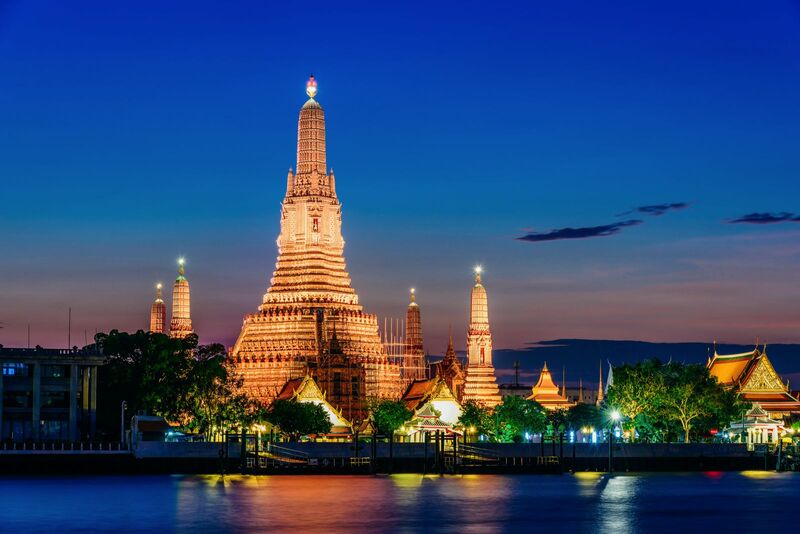 Across the Phraya River is the magnificent temple of Wat Arun. When sailing on the river, you can see this towering structure that has existed in some form since the 17th century. At the centre of the complex is the Prang tower which is encrusted with porcelain and is bursting with colour and detail. To add to this, there is an ordination hall, iconic status, and murals dedicated to King Rama V which are all totally worth seeing. 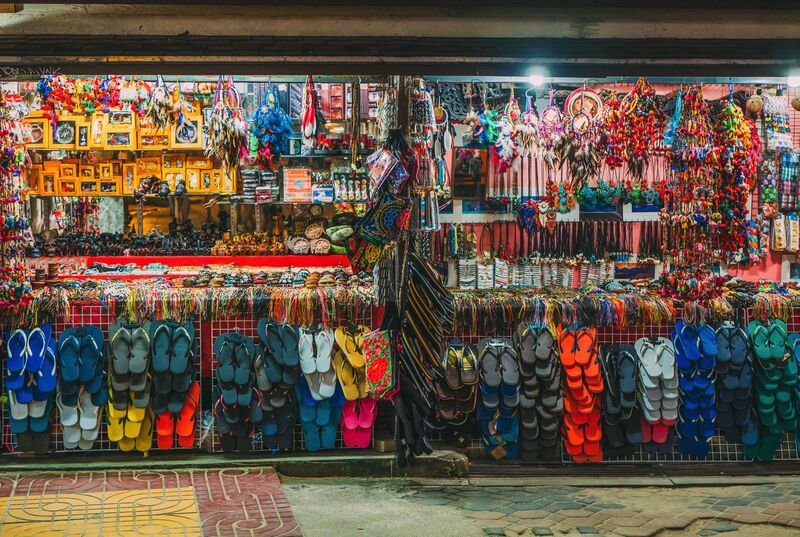 For an authentic slice of local life, the Chatuchak market is the perfect place to head to. As one of the largest markets in the world, you can walk past over 15,000 individual stalls selling practically anything you can think of – from fresh food and jewellery to brightly coloured clothes and pottery. Whilst the Chatuchak Market is vast and expansive, the Damnoen floating market is absolutely unique and offers a totally different market experience. 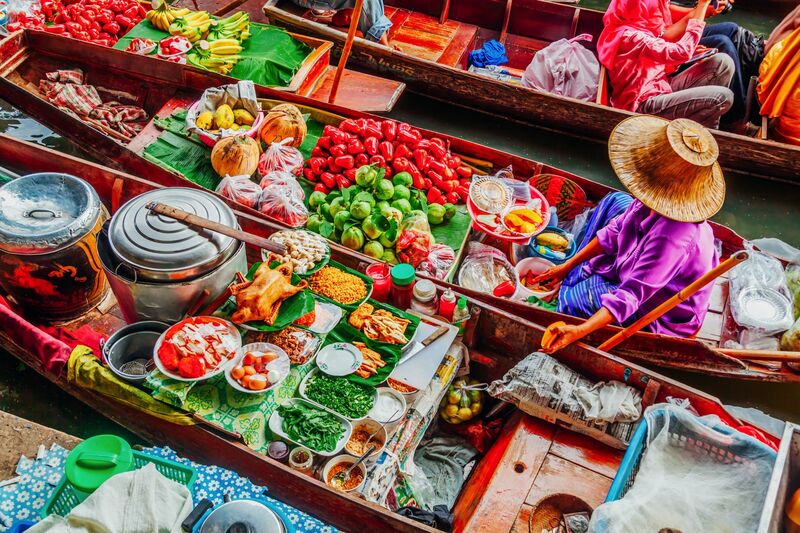 Riding along in traditional riverboats, you will float past a variety of different stalls selling fresh fruit and veg and other wares. 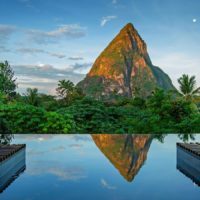 The food is simply delicious and the experience is unforgettable – guided tours are available here and will take you to the best spots which can be handy if you’re looking for spots that aren’t too busy with other travellers. 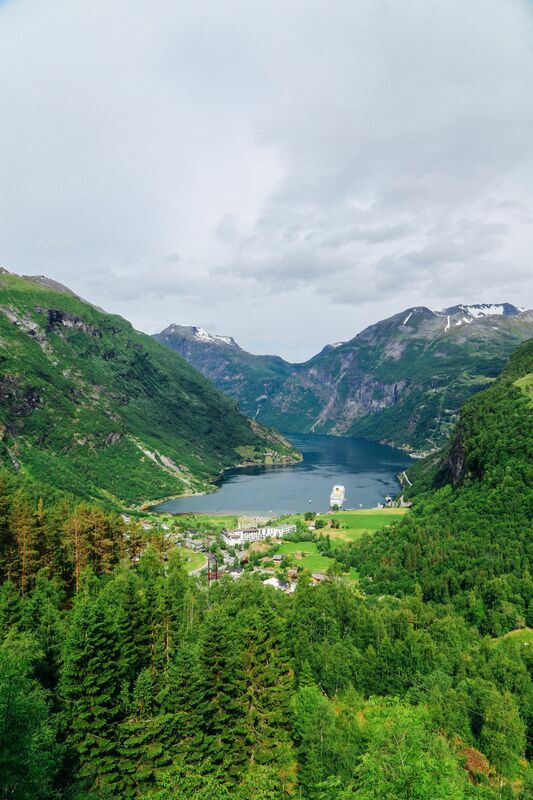 (I tend not to care – as long as I get to see the sights I want to see, I’m game to go somewhere absolutely quiet or one chock-a-block with other like-minded tourists, I’m far too caught up in my own amazement of the place to let this have any real impact on my experience). 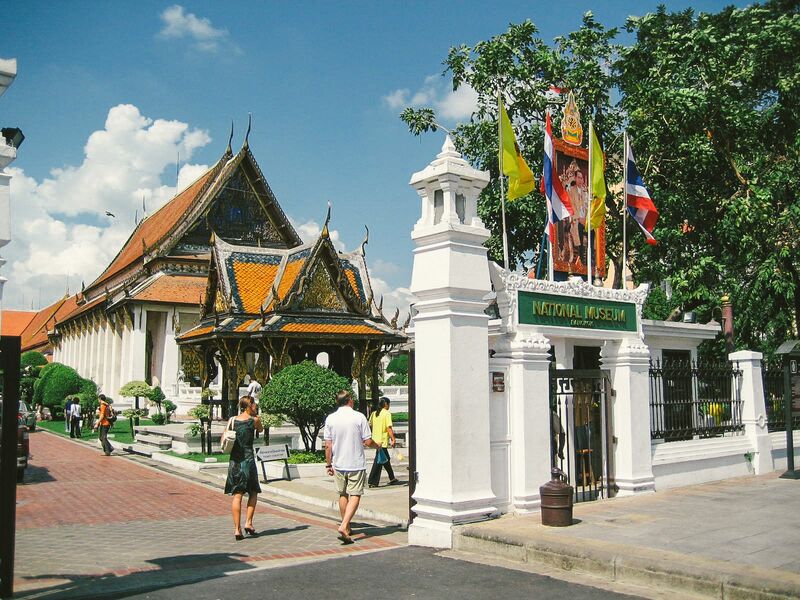 To balance your Bangkok trip, the National Museum offers an interesting history lesson and up until the 1970’s, was the only museum in the country. Hosted within the complex of the Wang Na Palace, the museum offers an insight into the history of Thailand through a series of artifacts; from weaponry, musical instruments, pottery, regalia to an impressive series of Buddha statues, you’re bound to leave with a greater appreciation for not just Bangkok, but Thailand as a whole. 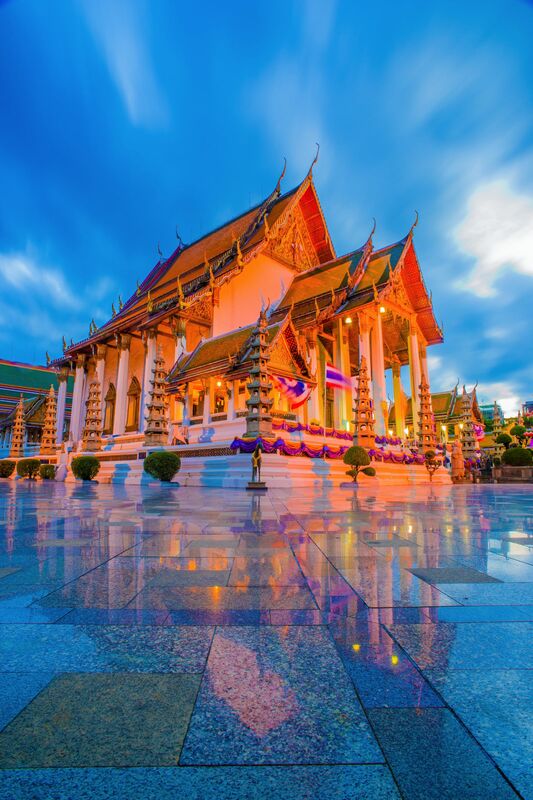 Enclosed within a walled complex, Wat Suthat is considered to be one of the most beautiful temples in the country. Initially constructed in 1782, this temple is packed full of colour, decoration, and artwork and is quite the visual feast for the eyes. The central temple is surrounded by a shimmering marble courtyard, whilst the interior is decorated with a dizzying amount of wall paintings. 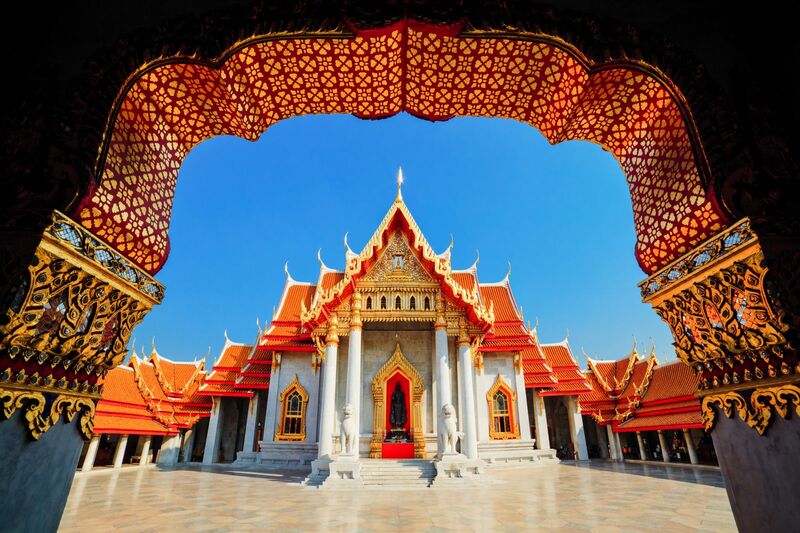 Also known as the temple of the golden Buddha, Wat Traimit is a wonderful sight in its own right! 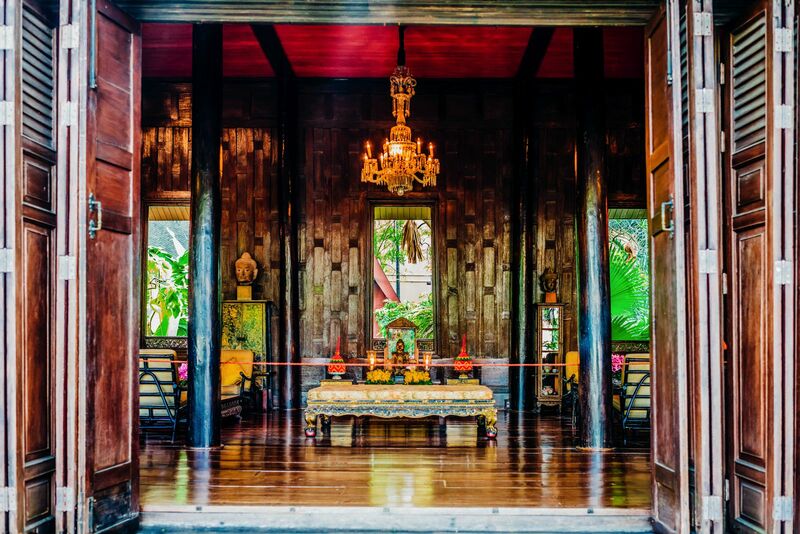 The typical Buddhist architecture creates a visually appealing building but the real treat here is the marvellous statue that is hosted inside – a 3.5m solid gold Buddha that weighs a staggering 5.5 tons. 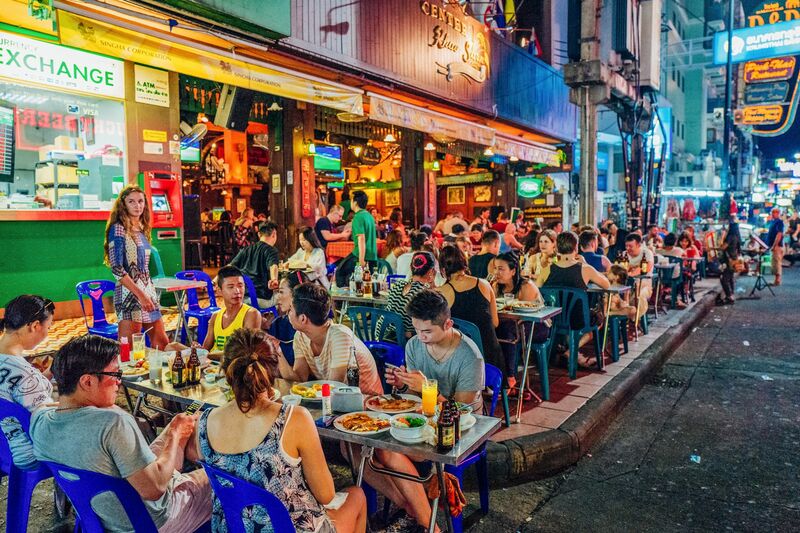 Possibly the best-known road in all of Bangkok, Khao San has a reputation as something of a traveller’s paradise. To experience the full-throttle nature of the city, this road delivers quite the sensory overload. 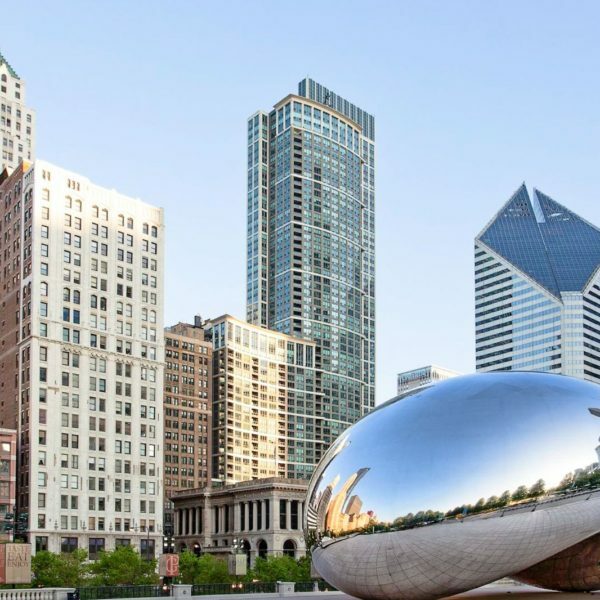 This strip is packed full of street food vendors, clothing stalls, bars and restaurants and is the perfect place to grab a group of your friends and head out to explore together! 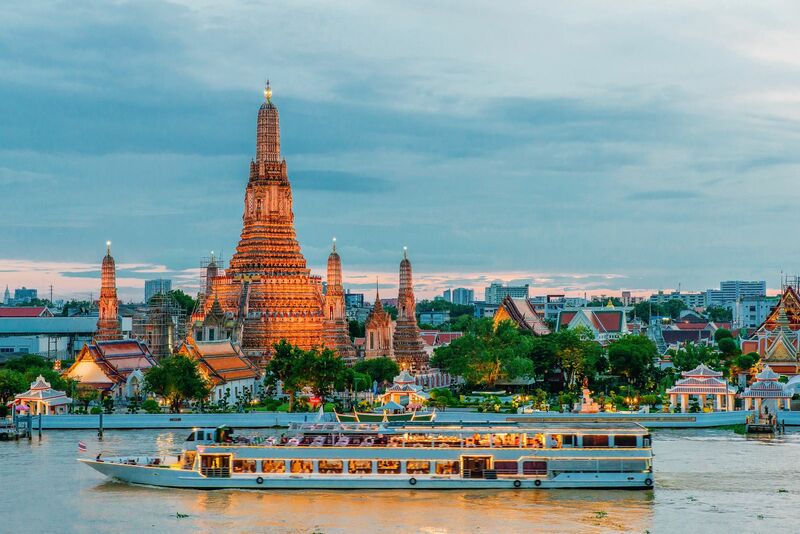 Snaking through Bangkok and eventually pouring out into the bay of Thailand, the Chao Phraya River is the life-blood of the city and is a busy waterway that offers the perfect chance to see the city from a different angle. There is a myriad of boat cruises you can take along this expanse of water so you should definitely hop on a boat to truly appreciate this part of Bangkok. From your boat, you will see the impressive Bangkok skyline and get to learn about the city’s history from your boat’s skipper.